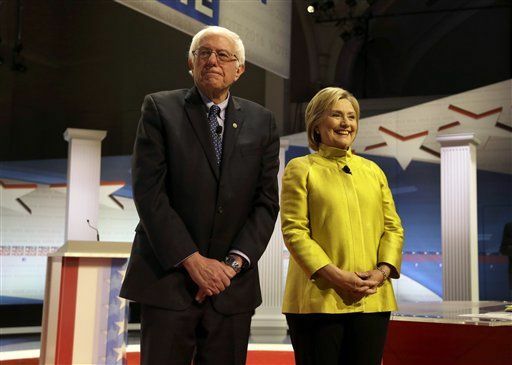 It's a common subject among Democratic presidential candidates Bernie Sanders and Hillary Clinton — agreement. They tend to bring up how even on their worst days, their arguments are still more civil than those of the Republicans. They especially tend to focus on this while they have the attention of national audiences, and they did just that during Thursday night's PBS Democratic debate. The word "agree" or some similar sentiment came up about 30 times during the 2-hour event, although, to be fair, they weren't always saying they agreed with each other. Often times it was that Clinton agreed with President Obama. In comparison, when you look at the most recent Republican debate, the word came up just five times. Clinton: "We both agree that we have to get unaccountable money out of our political system and that we have to do much more to ensure that Wall Street never wrecks main street again." Clinton: "You know, I think, again, both of us share the goal of trying to make college affordable for all young Americans." Sanders: "I would hope that we could all agree that we are sick and tired of seeing videos on television of unarmed people, often African-Americans, shot by police officers." 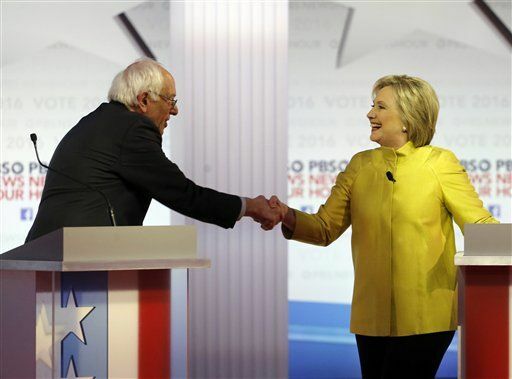 Clinton: "You know, I completely agree with Senator Sanders. The first speech I gave in this campaign back in April was about criminal justice reform and ending the era of mass incarceration." Sanders: "Nothing that Secretary Clinton said do I disagree with. This mandatory sentencing, a very bad idea. It takes away discretion from judges. We have got to demilitarize local police departments so they do not look like occupying armies." Clinton: "I think it's fair to say we don't have a disagreement. We both believe there has to be more money going into the Social Security system." Clinton: "So we have no disagreement about the need to buttress Social Security, get more revenue into the program. But I want to start by helping those people who are most at risk, the ones who, yes, are cutting their pills in half, who don't believe they can make the rent, who are worried about what comes next for them." Clinton: "Well, Senator, look, I think we're in vigorous agreement here. We both want to get more revenue in." Clinton: "I agree, however, it (Dodd-Frank) doesn't go far enough, because what it focuses on are the big banks, which Senator Sanders has talked about a lot, for good reason." Even when they disagree, it was "respectful." And just for the sake of counting, they mentioned the word "disagree" about half as much. Sanders: "Let me, you know, again, respectfully disagree with Secretary Clinton here." Clinton: "Well, I respectfully disagree. I think we have achieved a great deal with the Iranian nuclear agreement to put a lid on the Iranian nuclear weapons program." Clinton (agreeing with both Sanders and FDR): "I certainly agree with FDR for all the reasons Senator Sanders said. And I agree about the role that he played both in war and in peace on the economy and defeating fascism around the world." Clinton: "You know, we — we agree that we've got to get unaccountable money out of politics. We agree that Wall Street should never be allowed to wreck Main Street again." In total, that's at least 11 times that one of the two candidates straightforwardly pointed out that they agree with the other. Be Truthful. Don't lie about anyone or anything.